Bhujangasana- How to do Cobra Pose. Bhujang in Sanskrit, means serpent and asana means pose. In English we call this serpent pose; Cobra pose. Bhujangasana is a yoga pose done on the stomach on the floor. The chest and torso curl upwards away from the floor. Representing the snakes body and the arms and head the Cobras hood. The hands are used only lightly and not traditionally used to push up into the pose as the snake has no limbs. Bhujangasana is one of the most commonly used yoga asana (yoga pose). Due to the fact that Bhujangasana is a fundamental part of the traditional sunsaluation or surya namaskar. The sunsalutation is traditionally performed facing east in the early morning in greeting or salutation to the rising sun. It is said that the 12 steps of the traditional surya namaskar are a complete practice alone. Each pose offering massive benefits when practiced alone as well as when practiced as part of the detoxifying sun salutation. In a usual yoga class in most studios or infact any modern interpretation of yoga. 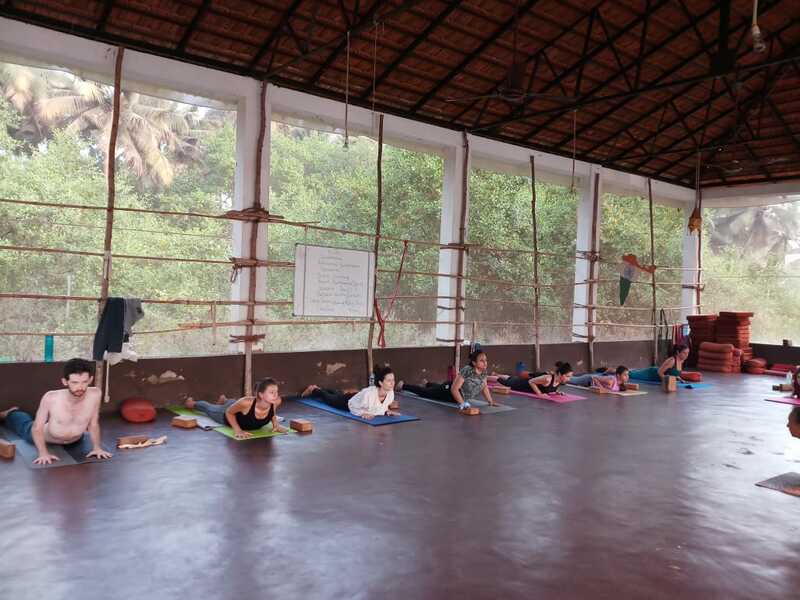 Bhujangasana and sun salutation variations are performed in almost every single class a very many times. This should be a great thing. We should see many benefits and an improvement in each individual practitioner. Sadly this is not the case. If a practitioner is to practice the same thing continuously wrong for an extended period of time they will not feel the benefits and instead feel some kind of strain, injury or imbalanvce occur. So, knowing Bhujangasana is so important means that getting it right is essential. The Cobra is often seen as an evil poisionous and dangerous representation. Not so for the Yogi. The snake is a friend of the yogi. When we look at ancient Indian mythologygy, we see the importance of the snake. Particularly the Cobra. For example The Blue faced God Shiva. He is pictured with a King cobra curled around his neck. This has some significance. The snake itself might raise alarm to many, it might signify danger. But this is not the meaning intended. Actually Shiva having made a connection and peace with the snake is a representation or symbol of a soul having overcome their fears and many other obstacles whilst finding their way along the path of spirituality. In Yoga philosophy their is the concept of Avidya. It is a Klesha, or in simple terms, it is considered as one of the five sources of sufering. Avidya is the suffering of ignorance. It literally means to not see, to not know and to not understand. It is a human trait to identify with the superficial changing parts of our being. The emotions we experience, our ever changing face, the thoughts we think and this entire identity we build around ourselves. When we try to fixate and identify with these things that will be ever changing and never lasting, we start to feel hopeless, lost or anxious. We have fixated on controlling something that cannot be controlled and that can produce all kinds of other emotion, thoughts and anxiety. And so, we go, around in a circle. Building layer upon layer of self doubt and illusion. To overcome this Avidya we must look deeply into ourselves and realise our true self is always there. Never changing and constant. Still and eternal in the center of the storm we have created for ourselves. The cobra and its poision, well they represent Avidya. In the example of Shiva wearing the cobra around his neck. He has realised his true self. He has mastered the posision amd is no longer afraid. Then the snake can do no harm. The snake becomes a friend. The Yogi who has mastered themselves in this way does not fear death, nor aging because they knwos it is temporary. They know that only that which is not real can be destroyed and the self is eternal. Bhujangasana is a wonderful pose, with many positive health benefits as well as energetical ones. Because Bhujangasana strengthens the major back extensor muscles it creates a general strength in the back supporting muscles. This can be really beneficial to those suffereing from back pain. It is really important to do the pose correctly to observe any of these benefits and stop further injury. This engagement and extension of the spine increases flexibility aswell. The effect of this kind of actition creates an energising effect on the body and mind. The practitioner may feel elated, open as well as confident and may function more effectively. The Bhujangasana also helps to open up the chest area. This is also creating space for the lungs to work at their full capacity. Greating energy in the body and increased oxygenation. The front side of the torso and legs is stretched and this gives a massage for abdominal internal organs enhancing the digestion- may improve, piles gas and constipation. Be careful to do this pose correctly. Students with spinal disc injury, or severe back pain should be very careful and only perform this pose with supervision of a professional. To perform Bhujangasana start laying down on your stomach. Place the top side of your feet down on the floor behind you. Feet are together in the full pose. Now press your pubic bone down into the floor. Inhale and start to lift your chest up from the floor. Only lightly pressing into the hands. Keep a micro bend in your elbows and relax your shoulders away from your ears. Lift the sternum up and feel a broadening across the chest. Lightly engage the buttocks but do not squeeze them. Gaze forward and up, but do not crunch the back of the neck, keep the neck long. For those with a compressed lower back or sacral area, it may feel better to take the feet hip width apart. This provides space for the lower back area and avoids extra compression. If there is any neck problem avoid looking up and look only straight ahead. For those with injury they might put no pressure into the hands at all. Instead floating the hands by the sides of the body.